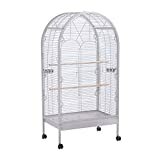 This large bird cage is ideal for your lovely birds living in high security, such as budgies, parrots, canaries, and so on. With a large interior space to allow them to be comfortable, this mobile bird stand also is very easy to keep clean and maintained. Come with an open top function, it allows the birds to sit on a perch. This entry was posted in Birds and tagged Aviary, Bird, Birds, Budgies, Cage, Cockatiel, Feeding, Finch, Large, Metal, Open, PawHut, Stand, Station, Wheels, x154H（cm） by One Boutique. Bookmark the permalink.